View More In Pizza Peels - Page 5. 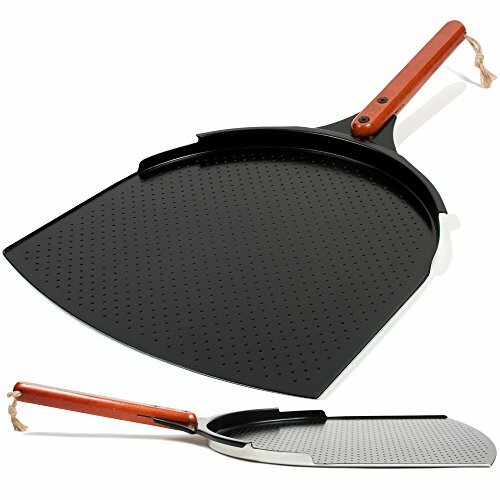 This sturdy, non-stick pizza peel combines the best features of wood and metal into one highly functional tool. Its specially textured surface and bottom make it easier than ever to slide your pizza on and off the stone, even if you're new to pizza making! Whether you're an accomplished home pizza chef or a newbie, the Ultimate Pizza Peel by Love This Kitchen simplifies the mechanics of building your pie AND getting it on and off the pizza stone. ENJOY the pizza making experience instead of worrying about a messy disaster! Made of lightweight, food grade aluminum with a nano-ceramic coating, this peeler also has tiny divots on its surface to allow for less contact between the raw dough and metal. So it needs less flour to help release the dough onto the stone. After all, who wants the taste of excess flour or burnt cornmeal on their crust? What's more, the bottom of our paddle has raised contact points to help it slide smoothly between the stone and your pizza, making it a cinch to take it out of the oven. The sturdy wooden handle is long to keep your hands away from the heat, and it's built at a 15-degree angle so you don't have to stoop down too much when removing the pie after baking. Upgrade your at-home pizza making experience with the Ultimate Pizza Peel - Click 'ADD TO CART' to buy now! ✅ TAKES THE HASSLE OUT OF BAKING PIZZA: Advance design allows experienced cooks and novices alike to get the pizza in and out of the oven with ease. No more worries about it sticking to the peel or the pizza stone, or falling of the sides! To help you make the best of your purchase, your peel comes with a detailed Instructions Manual (inside the package), an Online Video Tutorial (on our website) and a Bonus 108 Pizza Recipes Electronic Book (sent via email)! ✅ SAFER THAN REGULAR WOOD & METAL PEELS: Unlike pure wood, which must be cleaned, maintained and dried very well (otherwise mold, fungus and bacteria will grow on it), or metal paddles, that change the taste of your food, our Aluminum paddle has an inert, non-stick, nano-ceramic coating that is FDA Food Safe Tested, with NO Teflon or PBAs. ✅ NO NEED FOR EXCESSIVE FLOUR: Unlike traditional metal or wood peels, there is no need for excessive flour, since special divots on nano-ceramic surface are designed to help releasing raw dough onto stone (for best results, watch the online tutorial video). Your crust will taste like crust-not burnt cornmeal. ✅ UNIQUE DESIGN FOR AN IMPROVED & SAFER COOKING: (1) BACK LIP PREVENTS PIZZA SLIPPAGE: Back of peel has a raised lip to help keep the cooked pie ON the peel unlike regular peels, where it is easy for the pizza to slide off the sides. (2) ANGLED HARDWOOD HANDLE: Peeler has a 10-inch hardwood handle to keep a safe distance from the heat; positioned at 15 degrees, it allows easier access to the oven. (3) NO SPECIAL MAINTENANCE REQUIRED: Just wash with warm water and soap and you're done!